Textile Arts Center (TAC) was the brainchild of artist Visnja Popovic, who assembled a group of like-minded individuals, including co-founders Owyn Ruck, Isa Rodrigues, and Kelly Valletta. Jordan Martin joined shortly thereafter. The team was instantly bonded in mission. Together this power-house group of creatives developed both Adult Programs, Youth Programs, AIR (an artist residency program), Sewing Seeds (a natural dye education program), and 505 Textiles (a textile consulting service). Today, the space is equipped with 29 multi-harness floor-looms and 16 table-looms, representing several brands, models, sizes, and weaving widths. Even more, visitors have access to warping boards and mills, swifts, bobbin-winders, and threading + weaving tools. By providing artists, working professionals, students, and artisans with the tools for making + sharing fiber art in a gorgeous, naturally lit 3,200 sq. ft. workspace, the Textile Arts Center empowers the textile community and advocates for the handmade. We caught up with Kelly about this immense facility, and all of its incredible offerings. What classes do you offer, where are they hosted, and how much do they cost? At TAC we offer classes in floor weaving, tapestry weaving, natural dye, synthetic dye, shibori and tie dye, screen printing, blck printing, marbling, machine knitting, spinning, felting, sewing, book arts - the list goes on! Our classes range from $75 to $300, and take place in both our Brooklyn and Manhattan studios. We have classes running every day of the week, except for Fridays! Our roster of instructors is incredibly diverse. All classes are taught by some of the most passionate and talented artists, designers, and educators you will meet. Do most people come in to the studios with an idea of what they'd like to make, or is the primary interest from visitors in learning a specific craft? People come here for so many reasons! To incorporate textiles into their artwork, to get back to their craft, to expand their textile repertoire, and many just to have the experience of working with their hands. Whether it is to make a career shift, launch a business, or for a special project or collection, our classes allow for people to come from many different entry points. 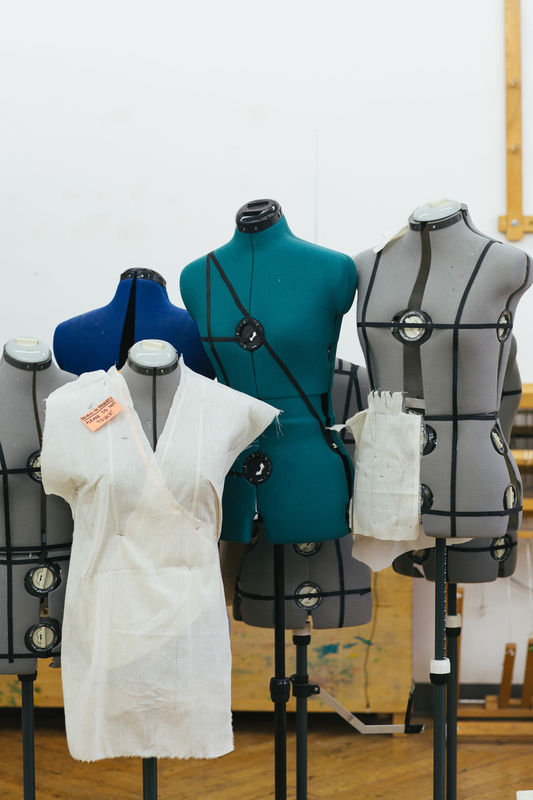 People come here to learn because they want to be surrounded by people who are actively working within the world of textiles. They come for the vibrant textile community. One of your facilities is in Manhattan; What's the difference between these two locations? Our Manhattan location is a great space on West 8th St. in the Village. We offer Adult and Youth Classes, and monthly we host a new artist or designer in our store-front as part of our Work in Progress (WIP) showcase. The space is also available for rent for different textile and pop-up events. Our Brooklyn location is much more of a working studio, with all of the same youth classes and camps, as well as more in-depth adult classes and open studios. It's also home to our 9-month Artist Residency Program (AIR). Tell us more about the residency program! How did it get started, who runs it, and what's it all about? The AIR Program is truly unique. Aside from being one of the few textile residencies in the world, residents have the opportunity to experience all of the artistic and cultural events New York City has to offer - whether that's going to exhibits for inspiration, meeting with designers and artists in the field, or getting behind-the-scenes access to studios and gallery spaces. This year our residents got to meet with textile legend Sheila Hicks, who gave a private tour of her show at Sikkema Jenkins, and spent over two hours answering questions from the group. Talk about textile perks! Since its creation in 2009, AIR has grown to include workshops, lectures, guest critics and mentors. Each fall, we invite 8 new residents to join our studios and participate in the 9-month program, which culminates in a group exhibition. Each year the curriculum and the quality of work is elevated, and year after year it's been so inspiring to see the process unfold. Isa stepped into the role of Residency Director this year, and to date, we've had nearly 50 residents participate in the program. We're so happy to be able to offer this incredible opportunity to artists. What sort of criteria do you look for in potential residents? Who are the current residents, and when are the next batch of applications due? Applications for AIR are now open! The deadline is April 17th and applicants can submit through our website. We also have pen enrollment for WIP in Manhattan. We're always looking for a number of different qualities, but most importantly, we want to assemble a diverse group of artists and designers. All of our residents must be willing to participate in productive and ongoing dialogues with their fellow residents. It's a community space, and we've found that people who are willing to communicate and be collaborative within the structure of the program will get the most out of the experience. You can find out more about our current cycle of very talented residents every second Saturday of the month at AIR Open House from 5-7pm at TAC Brooklyn, as well as Saturday's WIP open hours 2-5pm at TAC Manhattan. Come visit! Are there other facilities like the Textile Art Center around New York? There is just no place like TAC! Are all of the Directors artists themselves? Yes! Though teaching is the artistic medium we devote most of our energies towards, we are each artists and designers in our own right. I don't sell or show, but I am a maker. I definitely create for the discoveries made through the process. The day doesn't feel complete unless I have done some tinkering at TAC or in my wood shop, or studio at home. Though I love to share my work, I prefer to devote my free time to creating for my own enjoyment. Outside of TAC, where else do you personally go to find inspiration around Brooklyn? I'm taking a class with my husband right near TAC at Makeville Studio; wood turning on the lathe. It is so exciting to be opened up to a whole new medium and experience - I'm hoping to make a set of weaving tools! I also taught a series of workshops this summer at the Brooklyn Public library with one of my longtime youth students. In our research we came across a children's book called "The Woman Who Invented the Thread that Stops Bullets," about Kevlar inventor Stephanie Kwolek, as well as "Knit Your Bit," about young boys who knit clothing for WWI soldiers in the Central Park Knitting Bee. Awesomely inspiring. What message would you like to share with the Brooklyn creative community - either about textiles or TAC - that they might not already know? Learning the skills we teach at TAC can be incredibly empowering. Textiles are a huge part of our everyday lives as well as our history as humans, and we believe it is important to carry on these skills and traditions in order to support textile innovation. I would just encourage people to come and try out a class. People often say things like, "I'm not creative" or "I wouldn't have the patience or skills to learn how to weave, sew, etc." But TAC is the perfect place to get started - All you have to do is sign up and come with an open mind. You'll walk aware with new skills, and new (textile!) friends.